The Moskvitch 400-420 was a car launched by the Soviet manufacturer Moskvitch soon after the end of World War II. The first 400-420 was ready on 9 December 1946. Acceleration from 0-80 km/h took 55 seconds, and it had a low fuel consumption number compared to other Soviet cars at that time, achieving 9L / 100 km. On 28 April 1947, the Soviet government approved the 400-420 for mass production, and in the first year, 1,501 cars were assembled. That number rose to 4,808 for 1948 and reached 19,906 for 1949. In October 1952, the 100,000th Moskvitch rolled out. The Moskvitch was a very early Soviet automotive export product. As early as October 1950, 400 cars were offered for sale in Belgium. They were priced at the eqvivalent of 349 pound sterling, making the 400-420 cheaper than its British-made competitors Ford Prefect and Ford Anglia. After its launch in western Europe, it was praised for its quiet engine. The name 400-420 is a references to the engine type and the saloon body style. The Moskvitch 400-420 had a unitized construction with independent front suspension. It was powered by a 23 hp (17 kW / 23 PS) 1,074 cc (65.5 cu in) inline four engine with a compression ratio of 5.6:1. The woodie van 400-422 went into production in 1948. Payload: 800 kg. The 400-420A was a cabriolet which debuted in 1949. Many prototypes were made that never went into production, such as pick-up model and the 400-421 estate. 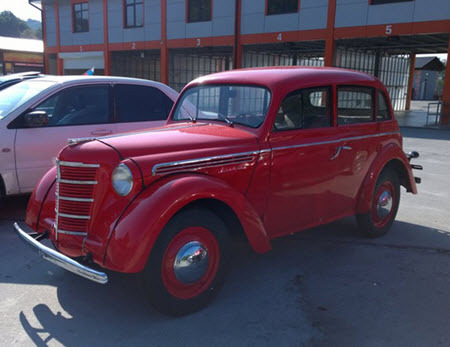 The first compact car produced in the Soviet Union was the KIM 10-50, produced in 500 units in 1940-1941. As Nazi Germany invaded Soviet in the summer of 1941, priorities changed, and the production of cars for private use had to take a step back as resources were needed for the war effort. Right after the war, in June 1945, Joseph Stalin personally selected the four-door Opel Kadett for Soviet mass production, and plans and tooling were reconstructed with the help of German engineers in the Soviet occupation zone. According to the Soviet government, the plans and tooling for the 1939 Opel Kadett K38 were a part of the war reparations package they were entiled to. Introducted in 1954, the Moskvitch 401-420 was essentially an improved version of the 400-420, powered by an 1,074 cc (65.5 cu in) sidevalve inline four engine, uprated from 23 hp (17 kW / 23 PS) to 26 hp (19 kW / 26 PS). The compression ratio was higher (6:2:1), and both the intake and exhaust manifolds had been improved. The top speed for the car was 90 km/h. The Moskvitch 401-420 was fitted with a new starter motor, wheel bearings, dynamo, and handbrake, but externally, it looked just like an 400-420. Some of the 401-420 cars were exported, to countries such as East Germany and Norway. In Norway, it became popular since private users in Norway had to obtain a special license to purchase a new imported car, but not if the car was from the Soviet Union. The Norwegian government had an angreement with its Soviet counterpart, allowing cars to be supplied in exchange for fish. The 400-422 sedan delivery was ismply renumbered 401-422. It remained in production until the end of 1956. 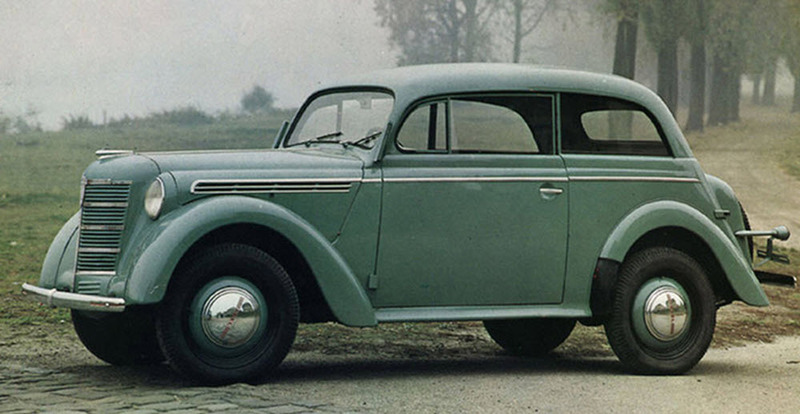 This was a coupé with a 35 hp (26 kW / 35 PS) engine. The 404 Sport of 1954 had a 58 hp (43 kW / 59 PS) overhead valve hemi engine.